So if you are following me on INSTAGRAM (which you should - lots of goodies) you may have seen my post about brewing my own kombucha! I’ve been doing it for a few months now thanks to my lovely friend Mandy. I kept pestering her to teach me and then she showed up with alllll the things I needed and made me a batch (what a great friend). I was so intimidated by the process but it’s so easy! Honestly if you can brew tea – you can make booch! 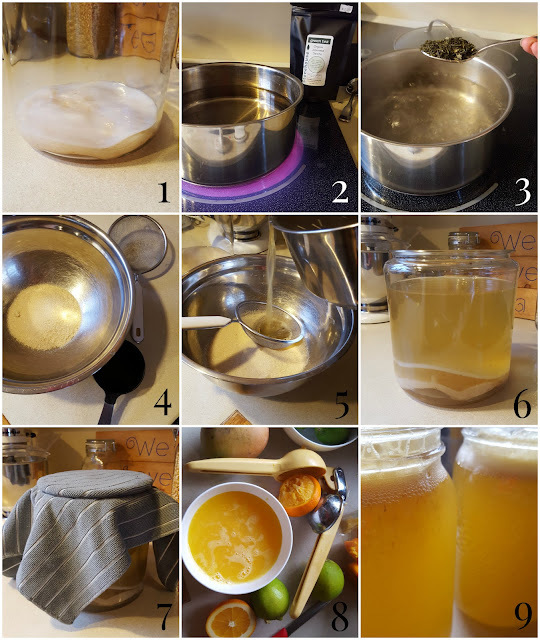 I’m still no pro – so I asked Mandy to pop over and write a little guest post on how to make kombucha! Here you go! My instagram post of my newest brew – orange, strawberry/lime x2 and pineapple! Hello! My name is Mandy Dugas and I am the creator of MandysHealthyLife.com. Along our journey we stumbled upon kombucha. I usually don’t buy drinks in stores but I was so thirsty one day and I had heard a couple of good things about Kombucha, so I reached for some. My first flavour was gingerale. It was amazing. It was a week later when Tod’s best friend Steve said he started making his own at home. “What?! You can make your own? Babe let’s do it!” I said. So Tod asked Steve for instructions. All we needed to do was find a scoby. A scoby (pronounced Sc-O-by) was the culture that fermented the liquid. I asked around at our local health foods store and eureka! A lady had one and was willing to share. So I took home this weird looking slimy thing, it was half jelly fish/half mushroom cap, and I grabbed some loose leaf organic tea, organic cane sugar, and water and got to work. I brewed the tea, stirred in the sugar and let it cool. Then I poured it into a large glass jar along with the scoby and covered it with a dish cloth and secured it with an elastic band. It needs to go in a warm place so I put it in our daughter’s room beside her heater. It only took 2 weeks to ferment. It was so fizzy! Like pop but naturally carbonated! I added a couple pieces of fruit to 3 1L mason jars. I poured in the fizzy fermented liquid, screwed on the lid and placed the jars back beside the heater to do a second fermentation, so the liquid could absorb some of the fruits flavour, making it extra delish! After 4 days it was ready to drink. Voila. Our very own Kombucha! How cool is this! As the months went on we were finding we were drinking it so fast that we needed more. Then more. After a year of experimenting with flavours, different teas and sweeteners, we found that green tea is by far the best tea, evaporated cane sugar works better than coconut sugar, and small pieces of fruit or cut up berries works better then whole. Juiced fruit works amazing! Our family of 5 (2 adults and 3 kids) loves our “booch”. We now have 7 batches of tea fermenting at all times! That’s 23 1L mason jars that I ferment every 2 weeks! That’s a job in itself. But it’s so worth it! · It is rich in Glucaric acid, which helps prevent cancer. People all over the world are now stating that Kombucha tea (and a diet of 80% raw and fermented) helped cure their cancer. So what to you say? Wanna give it a try? Here are the instructions! 1. First, you'll need a scoby – get one from a friend, the lady at the health food store, or on craigslist! Or if you want to make a scoby from scratch, you can get a kit from the store or you can order one online. Buy a glass cookie jar. I got mine from superstore - $12.99. It holds 14 cups of liquid, which is perfect for this recipe! Wash the jar and place your scoby inside. 2. Boil 6 cups of purified water (not tap water). Once it boils turn off heat. 3. Add 4 tsp. of organic loose leaf green or black tea (I prefer green). Steep tea for 10 minutes. 4. Add 3/4 cup raw cane sugar to a large bowl. Grab your strainer. 5. Once timer goes off, strain tea into the bowl with sugar. Pour tea leafs into the compost (if you don’t have a compost - buy a compost). Stir until the sugar dissolves. Add another 6 cups of purified water. 6. Once tea has cooled, pour into the jar with the scoby. 7. Place a clean tea towel on the jar and secure with an elastic or string. Place in a warm dark place for 2-3 weeks. 2 weeks in the summer and 2 1/2 - 3 weeks in the winter. 8. Once it’s fermented, carefully place a straw beside the scoby into the Kombucha. Cover the top of the straw with your finger and taste the Kombucha. If it’s sweet and fizzy it’s ready to be put into individual jars with fruit or fruit juice. You can use 2 tbsp. juice or 8 small pieces of fruit, like cut up apple or raspberries. 9. Steal mason jars and do a second fermentation. Place jars in the same warm, dark place that the Kombucha jar was in. Let ferment for 4+ days. Move to the fridge when you wish to drink it. You can let the jars sit in the closet for up to a month. Thank you so so much Mandy!! I love to drink mine in a wine glass so I feel all fancy!